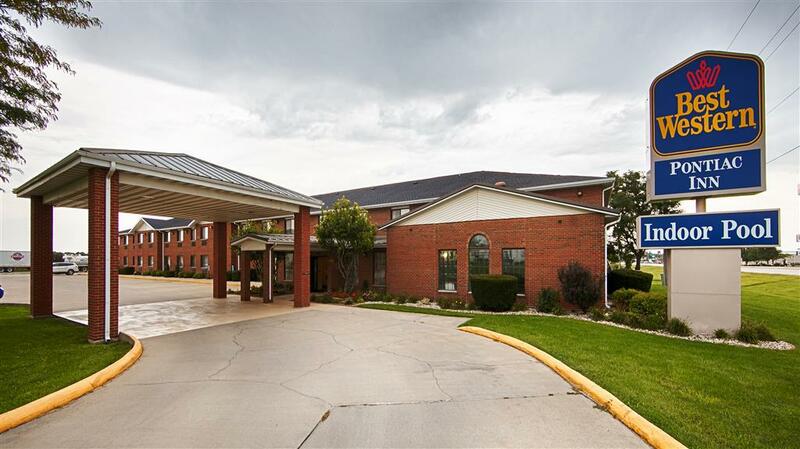 The Best Western Pontiac Inn is located off of I-55 between Chicago,IL. and St. Louis, MO. Amtrak also makes stops in Pontiac. With a calm atmosphere and convenient location, this Pontiac hotel is the perfect place to stay for a productive business trip or a relaxing vacation. You'll feel right at home in our newly renovated rooms with many amenities. The clean and modern rooms at this Pontiac, IL. hotel offer cable/satellite television with HBO�, a microwave, a refrigerator, a coffeemaker and much more. Before a day of meetings or sightseeing, get the perfect start to each morning with a complimentary hot full breakfast. With easy access to area businesses, you'll look forward to a business trip at the Best Western Pontiac Inn. Relax with just short commutes to Caterpillar Inc, R.R. Donnelly, Mecalux, Anthony Liftgate, Pontiac Correctional Center and Exact Packaging. With a business center, wake-up calls and free wireless Internet access, we provide thoughtful amenities to ensure your stay is stress-free. Explore the area during your stay - Historic Route 66, Route 66 Museum, Walldogs Museum, Livingston County War Museum, Pontiac-Oakland Museum, The Looking for Lincoln Trail and 23 Murals all located in Downtown Pontiac. Also enjoy several parks and three swinging bridges along the Vermillion River. Pontiac also has several events during the year, Red Carpet Corridor, Hangloose Car Show, Pontiac Cruise Nights, Thresherman's Reunion and Thresherman's Bluegrass Festival to name a few. For a list of things to see and do and events you can go to www. pontiac. org. Relax right here at the hotel, too - many guests feel rejuvenated after taking a dip in our indoor pool or our hot tub. Get even more out of your stay with added amenities, including our new exercise facility, guest laundry, a 24-hour front desk, guest computer center and free parking. For your stay in Pontiac with exceptional value, reserve a room at the Best Western Pontiac Inn. Enjoy your stay. �From: Chicago, IL. Take I-55 South to Exit 197. Turn left onto Route 116. Proceed through the stoplight for 0.5 blocks and the Best Western Pontiac Inn is located on the left. �From: St. Louis, Mo. Take I-55 North to Exit 197. Turn right onto Route 116. Proceed through the stoplight for 0.5 blocks and the Best Western Pontiac Inn is located on the left. 0.15 mile(s) from Subway�, fast food, American, open for: breakfast, lunch, dinner, located in Super Walmart�. 2.00 mile(s) from Joe's Station House, full service, American, open for: lunch, dinner, pizza and sandwiches. 2.00 mile(s) from Mario's Pizza, full service, American, open for: lunch, dinner, closed on Mondays. 3.00 mile(s) from Bernard's II, full service, American, open for: lunch, Closed on Mondays. Italian/American Food. Playground - 3.50 mile(s) from Chautauqua Park, beautiful park surrounded by the river. playground, horseshoe pits, frisbee golf, two pavillions and Vermillion Players Theater. Basketball court - 2.00 mile(s) from Fell Park, downtown. Has a basketball court, playground area and skate park. River - 2.50 mile(s) from Humiston Riverside Park, park on the river front. playground area, walkway, benches and swinging bridge. 4.00 mile(s) from Route 66 Museum, artifacts of Hall of Fame members. Route 66 photo journal exhibit by Michael Campanelli, The Bob Waldmire School Bus Road Yacht and The Bob Waldmire VW Bus. Plus much, much more!